A good cinematographer will reveal the spirit of a film by framing its subjects in virtuosic complexity, but a more gifted one will use the magnetism of a profile to infiltrate an entirely different sphere of reckoning. One must wonder if such inspiration is what follows those who come to photograph Daniel Day Lewis, one of the most captivating presences that has ever graced the movie screen. Never one to shy away from roles that stretch his remarkable dexterity, it becomes more than just a simple use of focus when a camera is drawn to his face; he seems to pull it away from all peripheral distractions, like a magnet of passion who must penetrate to the core of psychosis and expose its features in a head-on glory. As both a symbol of gentle courtesy and a figure of power and corruption, he quietly celebrates the nature of his characters in devious assurance. So it is little wonder that film photographers – usually so dominating on most movie sets – seem to regard his power with submissive awareness. And if such minds are genuinely in synch with the possibilities of their material, they would not be wise to ignore the opportunity of a golden standard. 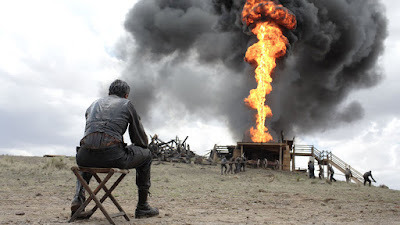 Nowhere is that more apparent than in Paul Thomas Anderson’s “There Will Be Blood,” a movie that is as dependent on the camera’s fascination with Lewis as its director must be with building his multifarious persona. There is a sense that Robert Elswit, one of the gifted photographers of modern cinema, envisions the greatest of moods in his caustic approach with the material. It isn’t full of rapid cuts or swift scene movements, because that would destabilize the throbbing tension that underlines the premise. But when the camera must arrive to the face of its intense figurehead – and it does so with alarming frequency – one gathers it to be out of necessity to strengthen the movie’s paralyzing hold over us. A great many shots of deserts and small towns and perplexed faces and exploding oil wells casting fiery shadows on a dark horizon will come to populate the film, but one lone man’s brooding snarl is responsible for giving wicked spirit to the images, like a figure that senses the harshness of his environment and turns it into a ballroom of savage opportunity. “There Will Be Blood” is a about the long and gradual descent of a man into the labyrinth of madness, roused by the nature of his profession and fueled by an experience that isolates him from the commonalities of culture and compassion. It allows us to see such erosion not in elaborate passages or even mind-altering plot twists, but rather in a succession of slow crawls through everyday life – some of them sad, others shocking, most of them brought on by a persistent hatred of man. It is by no sleight of irony that the movie begins by showing him wrapped in the comforts of isolation; as a haunting music chord slithers over the soundtrack, there are static shots of desert hills and fading sunsets before we join him – then a young and more adventurous sort – digging for precious minerals in a cave. His enthusiasm is only obvious when there are results, his reactions empowered by the acknowledgment of danger; when a cracked ladder sends him tumbling down among the rocks, a broken leg fills his face with what we sense is the first emotion he has experienced beyond mere displacement. That matter becomes slightly more complicated in subsequent years when the goals become loftier (a search for minerals turns into a quest for oil reservoirs), and an employee’s fatal accident at a dig site winds up leaving him custody of a young boy, who he will inevitably raise in his own cynical image. That man, the derisive Daniel Plainview, is played by Lewis with such depth and perceptiveness that one wonders how anyone – even the most serious of fans – could consciously recognize him. It is more than furrowed brows and a styled mustache that hide his familiar gaze; there are also pursed lips, a crooked posture and a vocal delivery that seem to erase all traces of his personality. The manner of his speaking voice continues to be the most notable of those qualities; after studying and refining the characterization for nearly a year before the cameras began rolling, Lewis eventually modeled his screen persona after John Huston in “Chinatown,” perhaps to emulate both the menacing authority of the actor as well as the ominous rituals of the film itself, which too dealt with the corrupt nature of industry out in the open spaces of California. To acknowledge that thought is to offer ourselves added insight, but the performance is a startling effort all its own, strategic and successive well into the final stretches, when characters have completely lost their way and are left only with the chaos of outright insanity. The movie progresses with this route primarily by creating a rivalry. Plainview is an oil man whose discoveries have propelled him into the high bracket of prestige during the beginning of the 20th century, but railroad shipping costs and few wells producing means he hasn’t quite reached the level of prosperity he craves. That is when a young and mysterious man named Paul Sunday (Paul Dano) shows up to his office, insisting that the family property up in the hills sits atop a giant undiscovered reservoir. Naturally, Daniel takes the bait and ventures off to study the claims, and when the search proves fruitful he skillfully tries to buy out the property from underneath the family patriarch. Unfortunately, young and religious Eli (Paul’s twin) knows they live atop oil and is audacious enough to call him on it, and the ensuing negotiation becomes one of silent taunting, all while he tries to manipulate Plainview into giving money to his church before carrying out his capitalist plans. Some in the audience suspect that this detail forms the basis for Daniel’s hatred of all things religion throughout the remainder of the picture, but such thoughts are not knee-jerk. So much ego overwhelms the Plainview approach that we suspect the anger he carries for God has been a life-long obsession, perhaps because he can’t stand the idea of not being able to overthrow him. One of the most effective constants in “There Will Be Blood” is the minimal use of dialogue. It is not a movie telling a story through conventional means. It passes time with lengthy pauses, steady shots and eccentric musical interludes (it flourishes in benchmark moments, and growls in others), indicating the quiet unravelling of the important parties. Sometimes that only amounts to seeing faces on screen while the camera centers on their expressions, often with it moving in at a snail’s pace so that we can watch those gazes change into something more revealing, more truthful. The direction by Anderson, already a force of reckoning at the movies, is revelatory in two specific ways: 1) it exhibits him going against his own trend of making complex ensemble dramas, and 2) it penetrates right to the nervous system of the psychology, showing us key beings in rapid moral decline without speeding them up through conventional film process. The movie takes place in a span of 29 years, and never does it rush through the delivery; at a lengthy 158 minutes, some of the best scenes simply consist of a static shot observing reactions with consistent focus, or creating tension around prospective exchanges that only come at the end of great pauses. Others still are all about capturing the spirit of the landscape; barren and hot, the desert seems to imprison its players in a struggle against fate. And because it is the nature of men to only accept one victor, it is a necessity (particularly with Daniel and Eli) to push on through the desolation until nothing remains but their own overpowering ego. Most great movies are lucky to find one or two great scenes amongst a cluster of decent ones. Here is a film filled with so many that we quickly lose track. A good deal of them come as a result of the most prominent of plot developments, particularly in a final act that shows its lead character descend farther into the maw of recklessness. There is a moment, for example, when Daniel attempts to buy another piece of land so that he can build a pipeline towards the sea, but in doing so comes face-to-face with a religious sort who is only willing to sell it if his buyer agrees to be baptized. That provides Eli, the pastor, a golden moment for humiliating his powerful opponent; after countless encounters over a barrage of disagreements and violent outbursts, they engage in an exchange in the walls of the church that is perfectly staged and modulated. Later still, Daniel lashes out cruelly (and unexpectedly) towards his grown son after he announces his departure for Mexico, and that sets the tone for a climax so jaw-droppingly unexpected that it rewrites our expectations of how resolutions can create their own rhythms. Many found this ending at the time of release contradictory to the careful precision of the rest of the picture, but that context is exactly what elevates the finale to such glorious heights. At the end of a long journey towards insanity, what is left, really, other than the impulse to wreak new degrees of violence and anarchy on all those present, including ourselves? That Anderson, so ferociously elevated by this thoughtful material, must direct it with such novel distinction goes to emphasize the evolution of his filmmaking sensibilities. Serving as understudy to the great Robert Altman during the filming of “A Prairie Home Companion” prior to this endeavor, his relationship with the seasoned veteran of cinema seems to have informed that approach further; his sense of character is more driven within the frame of reference of behavior rather than the limitations of a mere plot, and he is fully content to stand back, observe and watch on with plodding fascination without disrupting what is instinctual. Observing the movie is like seeing Werner Herzog taking a leisurely stroll through Stanley Kubrick’s nightmares. And if there is any doubt left in his ability to match those perceptions with haunting production values or dedicated writing, then that view must be shattered: the screenplay (very loosely adapted from Upton Sinclair’s novel “Oil!”) is a deafening endorsement of minimalism all while exaggerating its key personalities, bringing them to a unity of contrasts in which they must descend further into their own psychological prisons because 1) it is in their nature, and 2) their passions – religion and capitalism – are the most distorting of human temptations. While Anderson’s film emerged as one of the big award front-runners of the 2007 season, it ultimately lost the most coveted trophies to another picture shot in the backwoods of Texas that year: “No Country For Old Men” by the Coen brothers. Such a reality, thankfully, did nothing to diminish its boundless influence over the course of time. Nearly a decade has come and gone and the movie generates a potency that transcends all artistic foundations. The quiet scenes, so evocative against the ominous musical score, have become creepier and more meditative. The dialogue, often seeming to be harsh because it jars against the wide gulfs of silence, penetrates to the center of its characters’ reasoning, refusing to dress them up in elaborate facades. The performances – especially Lewis’ and Dano’s – reach outside the spectrum of populist portrayals and discover the barren mind of a corrupted value system. And the film’s remarkable production standards, assembled from a crew that has followed their director through a lifetime of cinematic endeavors, take what otherwise might have been a routine premise and turn it into a powerful, shocking and visually precise example of how careful artistic sensibilities can captivate us all while undermining our cynical defenses. “There Will Be Blood” represents an ascendance of talents into the engravings of cinematic history. It is the work of masters perfecting their craft, setting off together towards a horizon of shining prowess to discover, quite literally, the pinnacle of their cinematic potential. And as a vehicle exemplifying what remains possible for character studies that lack the glossy appeal of the Hollywood circuit, there is no question that Anderson has intoned an experience here that will go on to become the stuff of legend.